Basically I think it's for the iPhone 8 with screen issues. Quick update , not much there . Updated my two devices... no issues. I didn't expect much change... 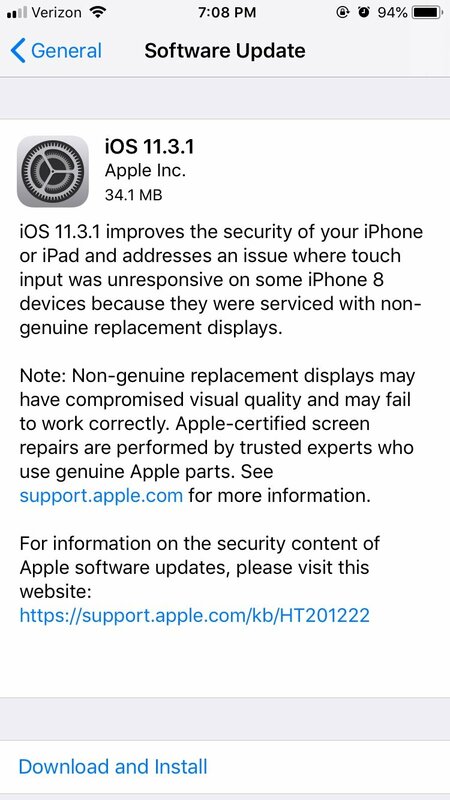 I knew that the primary reason for the update was to fix the issues people who had installed 3rd party replacement screens. But whenever there are security updates, I update! I updated too. It was a quick one. After I updated last night I ran a Geekbench. The best numbers I’ve ever seen on my 6s. Performance so far is very good. Updated my Air 2 and 6S. No issues on 6S but Air 2 keeps losing wifi connectivity. Even after resetting wifi. Try resetting the network settings or restoring the device and then setting it up new. Home button and touch ID seem really borked on my iPP2 12.9. Touch ID especially. If I try to add a new fingerprint, I just have a blank white box; the red whorls don't appear and no fingerprint registers. Reboot the device or choose the "reset all settings" option.